UK – The European recycling group, Veolia and UK-based restaurant chain LEON have partnered to trial a deposit return scheme in the UK to promote on-the-go recycling. 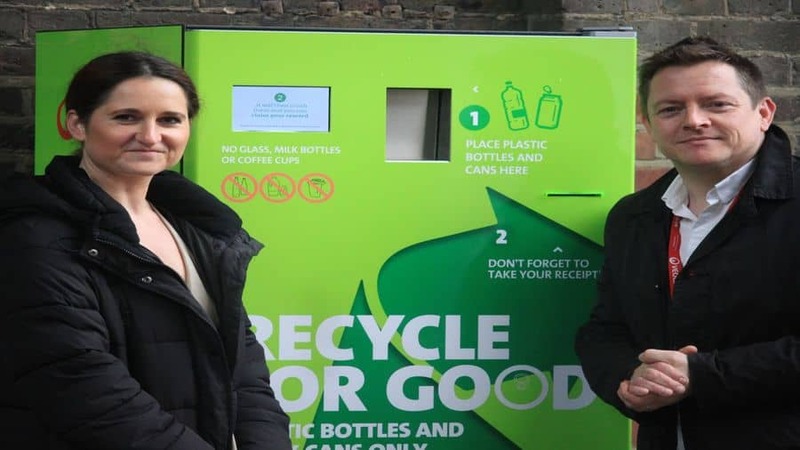 The two have unveiled a reverse vending machine designed to accept plastic bottles and aluminium cans at King’s Cross in central London, UK. The pilot will run for six months to encourage people to recycle while on the go, addressing the rising concerns around plastic packaging and their pollution implications on the environment. Veolia said the partnership was backed by research which shows 81% of people would go out their way to deposit a bottle or can. For any bottle returned, a voucher worth 10% off the bill will be given at the nearest LEON restaurant. The parties indicated that the pilot has been designed around consumers to target the disposable drinks containers most commonly discarded on the go, bottles under 750ml as well as aluminium cans in order to make it easy for people to recycle, reduce littering and enable more materials to be salvaged. “At LEON we’ve been committed to be the most sustainable business we can be since we opened our first restaurant in 2004. Through our Planet LOVe programme launched in 2019, we will carry on investing in new ways to reduce single use plastics and find better recycling solutions because, put simply, the planet needs us to,” said John Vincent, CEO & Co-Founder of LEON. Veolia will collect and process the machine’s contents, ultimately transporting the bottles and cans to be recycled into new products. The firm estimates that Britain fails to recycle 40% of plastic bottles because they aren’t placed in the right bins, that’s over 240,000 tonnes of bottles not reaching recycling centres every year. It has been identified that a formal UK-wide deposit-return scheme would be ideal in tackling plastic waste. “We want King’s Cross to continue to be an exemplar of sustainable development and we see the way in which waste is managed as a key part of this. We are proud that we don’t send any waste to landfill, but we want to improve the amount of plastic waste that gets recycled from public areas and ultimately eliminate single-use plastics,” said Steven Kellett, Sustainability Manager at King’s Cross Central Limited partnership (KCCLP). Last year, UK retailers including Iceland, Tesco and The Co-Op launched reverse vending trials to encourage consumers to recycle their plastic bottles. Recently, Veolia joined forces with Nestle to tackle plastics leakage into the environment and develop recycling schemes.